These gorgeous mulberry lollipops are an indulgent treat for young and old. This tempting rawfood recipe prepares approximately 20. Whilst organic mulberries can be devoured as a healthy snack straight from the bag, there’s no better way to enjoy them than generously coated in rich, raw chocolate! 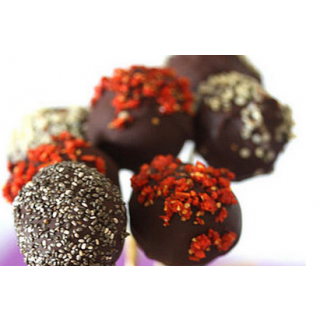 To prepare the mulberry lolly, firstly gently melt the coconut oil until it becomes melted. Pop your organic almonds into your blender, blend into a fine flour and place into a mixing bowl. Next blend the organic mulberries with a pulsing action. We like to blend it roughly for some texture and crunch. Pour this into your mixing bowl with the almonds. Now add in the raw honey, organic vanilla bean powder and coconut oil, and mix thoroughly using a spoon. Place the filling into your fridge and leave to chill for around 45 minutes. Remove the filling mixture from the fridge, roll into round balls and place onto a baking tray. Pop back into the fridge for a further 30 minutes and then insert a lollipop stick into the base of each. To make the yummy raw chocolate coating, gently melt the organic cacao butter. Now mix in the agave nectar, organic cacao powder and the organic vanilla bean powder and whisk until lovely and smooth. 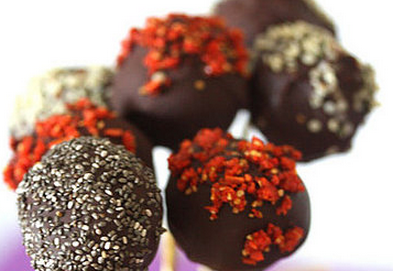 Dip each lollipop into the raw chocolate and roll until evenly coated. We decorated ours with some chopped goji berries, sesame seeds and chopped walnuts, but the choice is yours!